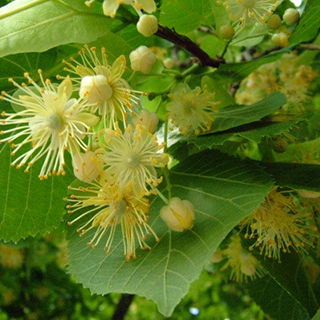 Commonly planted in gardens and parks, the lime or linden tree bears flowers that perfume the air on summer evenings. The delicate scent acts much in the same way as the infusion made from the flowers, soothing troubled states of mind and relieving tension headaches, migraines, and sinus congestion. Limeflower is considered to be an excellent remedy for head colds and mild fevers, as well as nasal or sinus catarrh; drink small amounts of limeflower tea frequently throughout the day. The infusion also helps with poor sleep. Combine with passion flower (Passiflora incarnata) to increase the sedative. Boil 1/2 liter of water and add 2 teaspoons of linden (lime) flowers. Let it infuse for 8-10 minutes and then filter the content. Take 3–7.5g a day, or max. 50g (2 oz) per week. The tea (see above) also makes a good steam inhalation to ease sinus headache and congestion. Limeflower helps to cool and relieve anxiety states, particularly when symptoms include head and neck tension, palpitations, and feeling "hot and bothered". Take 3–7.5ml a day, or max. 50gml (2 oz) per week of a 1:3 tincture. Linden trees can be grown from seed and can be planted in well-draining soil that is acidic, neutral or alkaline. It does need a steady supply of water as it does not tolerate drought.